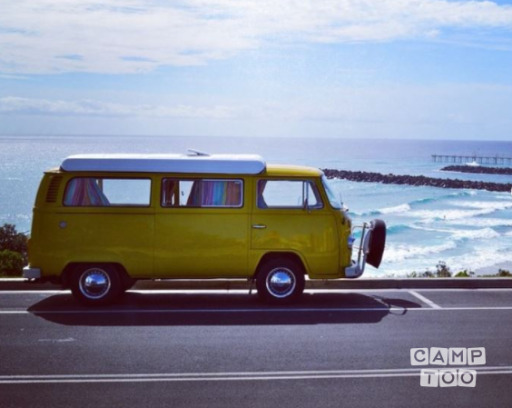 “The Colonel” is a 1974, pop top, bay window, VW kombi T2, (yellow) and has a 1800 petrol engine and can seat 2. “The Colonel” is a fantastic example of the original 74-kombi interiors and is in outstanding condition. The van can sleep 2 adults with a fold down bench seat or an option for a child or person under 60kg sleeping on a roll out bunk bed above. The van comes fully equipped with all the necessities for your trip, including a battery run or 230V fridge, camping stove, on board water supply, crockery and storage space. If you want to travel further than 300km from Byron we will need to have a chat before we agree.